General Synopsis: Three flatmates purchase an antique mirror rumored to be haunted, and set up a camera in order to capture any evidence of paranormal activity to win the James Randi Million Dollar Challenge. In-Depth Plot: So because I enjoy Found Footage movies, I decided to give this one a watch as it had been sitting in my queue on Netflix for a bit. I enjoyed the movie and was definitely creeped out by the movie. On the horror scale, the movie does have a good build-up, but is a slow burn in terms of horror. The early parts of the movie are slow and pretty general, showing the characters, Matt, his girlfriend Jemma, and their friend Steve talking about what they’d do if they win the challenge and about their individual beliefs on the supernatural. Things are pretty calm, and start to escalate when Matt is caught by the other two characters sleepwalking and staring at the mirror (which he explains the following morning that he frequently sleptwalked when he was a child and stopped when he got older). He remembers nothing and is a little perturbed by the fact it is emerging again. There are some cliche things as the group uses a Ouija board to try and contact any ghosts, and Matt pretending to sleepwalk and grab a knife from the kitchen. The camera that was set up in place of the mirror set to record 24/7 so as not to miss anything, is discovered to turn off in the middle of the night, though nothing else is seen. Matt’s sleepwalking increases in frequency, and Steve has Matt wear a Go-Pro camera to record what he does in his sleepwalking thinking it may be something supernatural causing it. This is when things start to get creepy. We’re shown the camera on Matt recording, as he slowly walks to the kitchen, grabs a kitchen knife and watches his roommates sleeping, with occasional camera glitches indicating something strange is occuring. This is about the extent of anything paranormal so far, of seeing Matt’s sleepwalking, grabbing a knife, and watching his roommates sleeping. Steve and Jemma become concerned as Matt refuses to show them the Go-Pro footage from the night before (leaving only the audience to know what he is doing at night) and Matt is becoming more withdrawn, angry, and obsessed with the mirror. Things escalate when the group comes back from an outing and find their apartment trashed, and Matt grows even more angry. Jemma wakes up one night to find Matt standing in the kitchen with a knife and Jemma sleeps in Steve’s room after blocking the door. Steve and Jemma become concerned with their safety as well as Matt’s. The next morning, Matt begins to grow more angry about his sleepwalking habits and that the two aren’t doing anything to keep him from doing anything harmful to himself or others. They also begin to wonder if the experiment with the mirror is causing too much stress and consider getting rid of it and ending the project. Jemma and Steve resort to hiding the knives at night and Jemma stays in Steve’s room. Again, the Go-Pro on Matt is recording his nightly wanderings and we are seen Matt’s point of view with a knife and trying to get into Steve’s room. On Steve’s camera, Steve and Jemma wake up hearing Matt try and enter the room, and then hear silence and a door shut. Now we are back to Matt’s camera as he is wandering the streets at night, carrying a knife and then begins to follow a woman, who uses pepper spray just before he stabs her and runs away. After some hours, Steve and Jemma hear Matt return and find him passed out on his bed, with dirt on his feet, but no sign of the knife and unaware he was maced. The next morning, when Matt takes a shower and determined to see what Matt’s camera caught when he left the apartment, the two can’t find it and then see Matt standing in the hall and is panicking that he can’t see and eventually calms down and sleeps. Steve get frustrated that the camera in front of the mirror keeps shutting off at night, and the two decide based on Matt’s behavior and his reclusiveness that if he sleepwalks again or doesn’t get better, they will get him help the following morning. Again, Jemma stays in Steve’s room with the door barricaded. Finally, we get to the part of the gore and one of the creepy parts of the movie. We are seen the mirror camera and Matt’s camera, where Matt stands in front of the mirror watching it. Matt then begins gouging out his eyes. After doing so and “staring” at his eye-less self, he once again leaves the apartment and wanders the streets at night, finding a victim and killing her and gouging out her eyes as well and taking them with him. The next morning, Steve and Jemma wake up to find Matt missing, and the only evidence of something happening being a small bit of blood on the mirror camera, but the footage from the night before is not there. They wonder why Matt is missing and ponder their next steps. The following night, Jemma is screaming and Steve discovers that she has cut herself from the emotional stress. The next morning Steve takes the mirror into the woods and smashes it. Things seem quiet and fairly normal as the two begin to consider their next steps on finding Matt and about if they should continue the project or not. They have a spark of hope as their buzzer rings and Jemma thinks it is Matt, when Steve goes downstairs he comes back up stating no one was outside. Finally, we get to, for me, was the creepiest ending in the movie. That night, Steve wakes up to find four scratches on his stomach, and walks out into the hallway and sees Matt standing in Jemma’s room, with his back turned to him, he approaches slowly and sees Matt’s hands are covered in blood, and his nails are long and almost claw-like. When he turns away, and looks back, Matt is gone, and Jemma is missing from her room as well. 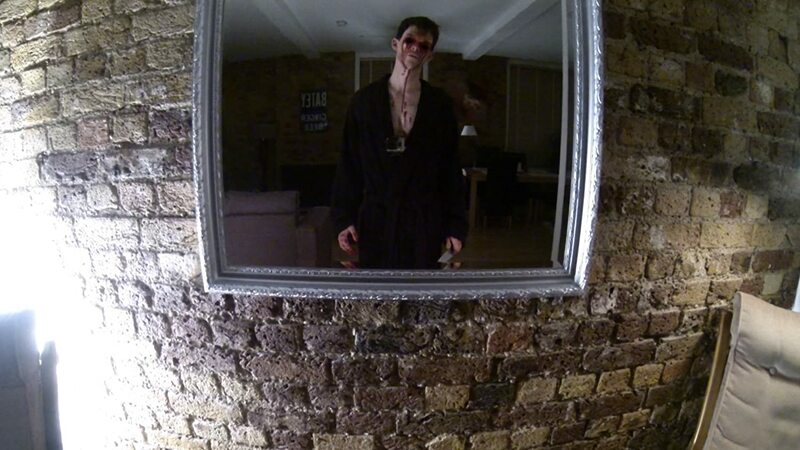 No one is in the room, and Steve ventures into the living room and finds the mirror perfectly intact on the wall. We see Matt’s eyeless reflection in the mirror behind Steve, and when he turns around, he finds Jemma standing in the kitchen alone, back turned to him. As he approaches, Jemma turns, revealing her eyes gouged out, stabs Steve, and he falls to the floor, bleeding and the camera goes dark. We are then given a caption stating none of the bodies were found by police, and the film was submitted to the James Randi foundation and that the mirror was also missing and has not been recovered. Review: Overall, I found the movie to be very creepy and the ending definitely sent some shivers as your sitting there wishing Steve would just run the hell out of the apartment. However, there were some plot holes that are brought into question. Chief complaint is the origin of the mirror. Very little is given about the mirror by the characters other than they saw on eBay that it is supposed to be haunted. But no information is given as to who was selling it, why, or even what the hauntings are supposed to be from anyone thats owned it (of course a mirror that makes you gouge out your eyes and collect other eyes IS a hard sell…). Also there’s no information or hints found as to why the mirror makes you gouge out eyes and what makes it so evil aside from newspaper clippings on the back that mention murders in the 1930’s. I mean, none of the characters really see anything and Matt’s camera is the only thing that experiences anything paranormal and the character never shows the others what happens on his camera so only Matt and the audience knows what goes on when he’s been sleepwalking. The other part of what is strange is that the only time the police are involved is in the end when the three go missing, but the woman that maces Matt , and the woman that was killed (We don’t see what Matt did with the body) draws no attention and is unclear as to the link for the incidents. It is a slow burn and can be a bit boring early in the movie, in that it does take a while for anything scary to happen and it is all very subtle. The ending to me was very creepy and effective in how it was played out. It definitely leaves the door open for a potential sequel. My main complaints are there are some parts of the plot that fall flat, and the characters seem almost fake in some aspects and aren’t really developed enough to seem real and seem like cliche trope characters. The obsessed paranormal fan, the skeptical friend, and the friend that doesn’t take the situation seriously. Other parts like…what do the characters do that they can all sit around at home for a week unless they all took a vacation from work for the mirror, and don’t seem to have any friends outside of each other, which makes you wonder who contacted the police in the first place. As well as the fact that neither Steve or Jemma think to call the police when Matt goes missing for what we assume can be a couple days based on the passage of time in the movie. Another negative is that while there is relatively little blood and gore in the movie, what bit there is, is already spoiled by the movies cover and promo picture of Matt’s eyes gouged out, and even the trailer alludes to him doing it. I think if they’d left it out of both mediums, the scene would have been alot more effective. Rating: Plot holes aside, I still give the movie a 4/5 and recommend it as a good watch.